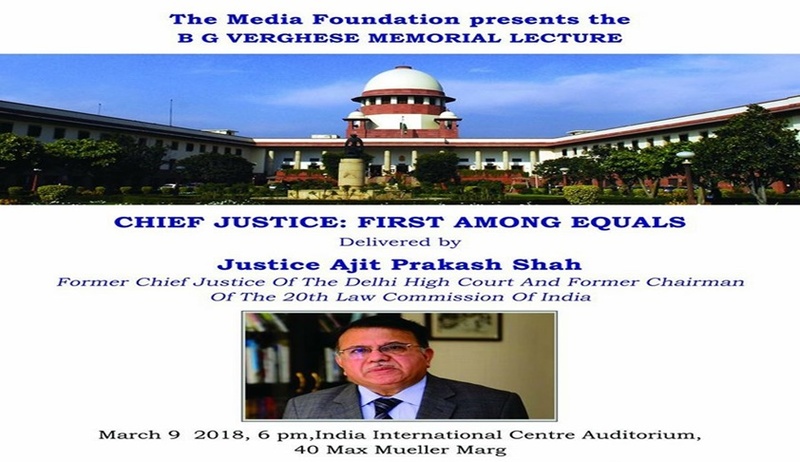 The Media Foundation is organising the BG Verghese Memorial Lecture on the theme, ‘Chief Justice: First Among Equals’. The lecture will be delivered by Justice Ajit Prakash Shah, Former Chief Justice of the Delhi High Court and Former Chairman of the 20th Law Commission of India. The lecture will be preceded by the presentation of the Chameli Devi Jain Award to an Outstanding Woman Journalist. The lecture will be followed by a short presentation on ‘Free Speech in India and Asia’ by Steven Butler, Asia Programme Coordinator, Committee to Protect Journalists. Seating is limited and will be on a first come first serve basis. The official announcement for the event can be found here.